Jail House Rock,Colourised. Jail house rock colourised. Wallpaper and background images in the এলভিস প্রিসলি club tagged: elvis presley film jail house rock image clour picture photo. This এলভিস প্রিসলি fan art might contain ধারণ সেল and holding cell. 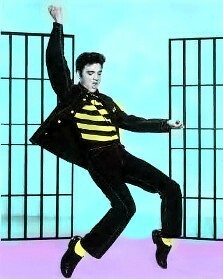 It just dawned on me from this picture that Elvis was doing that toe move before Michael Jackson! I never noticed that,I think your right !